BBC Two - Trust Me, I'm a Doctor, Series 4, Episode 2 - Are perfumed products bad for me? Many of us love using fragranced products in our homes. We buy air fresheners, plug-ins, scented candles and even everyday cleaning products based on how they smell. But few people have studied the chemicals used to fragrance these products - and what happens to them once they are released into the air inside our homes. Fragrance chemicals include limonene (citrus smell) and alpha pinene (pine smell), and they are very common in household products. They are not in themselves thought to be dangerous, but the problem is that once they are released into the air inside our homes, they don’t just disappear. They react in the air to form new chemicals, which could be potentially harmful. Our modern homes are making this problem worse. In old, draughty houses there was enough airflow that the air inside the home was roughly the same as the air outside. But now our homes are much better insulated and ‘air-tight’ - meaning that anything released into the air inside is much more likely to stay there. Good news for energy efficiency, and keeping outdoor air pollution out – but potentially bad news for creating indoor air pollution. Trust Me, I’m a Doctor teamed up with Professor Alasdair Lewis and his team at the University of York to measure the levels of these chemicals in homes. We recruited 6 households in York, who all live in very similar modern homes with similar outdoor air quality. 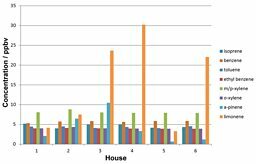 First of all, with the help of Ally and his team at the University of York, we placed an air sampler in each house for 5 days to tell us which homes had the highest amounts of chemicals, and what those chemicals were. We asked each household to keep a diary of what household products they used over the 5 day period and how often they used them. We also tested for formaldehyde in 3 of our 6 households. Ally’s lab studies show that for every 2 molecules of limonene released in the air, 1 molecule of formaldehyde is formed. And it isn’t a chemical we really want in our homes. Formaldehyde is a known secondary product of fragrance chemicals when they react in the air. It is a carcinogen (a cancer-causing chemical) and can cause skin irritation and respiratory symptoms. At the start of the experiment all the houses had similar levels of most chemicals - except the ones from fragrance. 3 of the 6 households had the highest levels of limonene, which corresponded to the amount of household products and scented candles they used. Importantly we also found that levels of formaldehyde correlated with the levels of limonene. There is a small body of research suggesting that houseplants could possibly have powerful chemical-absorbing properties. One of the key papers was even published by NASA in the 1980s to investigate how levels of chemicals in enclosed space stations could be reduced. This research has predominantly been carried out in the lab, with some evidence that it could work in an office. But to our knowledge it had never been tested in the home. Until now. We placed 4 houseplants in each of our volunteer families’ houses for 4 weeks. We then took new air samples at the end of the experiment to see whether the plants had any effect on the indoor air pollution in each home. The plants we chose were based on previous research, and advice from scientists working in this area: Chlorophytum (Spider plant), Dracaena (Dragon tree), Scindapsus (Golden Pothos), Hedera helix (English Ivy). Our experiment took place over the month of November, when the weather got colder and nights got longer. Our households changed their behaviour accordingly, shutting doors and windows more and using more scented candles for longer periods of time. The final results showed that instead of the plants reducing the levels of fragrance chemicals in the homes - the limonene actually increased. In fact, it rose to a level that our scientists had never seen before. And the most likely explanation was the extra candles and fewer open windows. Since limonene reacts in the air to make formaldehyde, you would expect the formaldehyde to rise as well. But levels of formaldehyde actually fell in all three of the homes we measured (in contrast to the rising limonene), while the plants were in there. What else can I do to reduce levels of these chemicals in the home? Our experiment has shown that you have control over the levels of these chemicals in your home. If you want less of a chemical like limonene in the air then use fewer fragranced products such as air fresheners and scented candles, and choose fragrance-free cleaning products where available. You can also ventilate your home better — so next time you light a candle, open a window as well.